If you’re fond of watches that evoke all of the glamour, speed and adrenaline of high-octane motor racing, then you’ll enjoy learning more about the Tag Heuer Monaco Calibre 36. 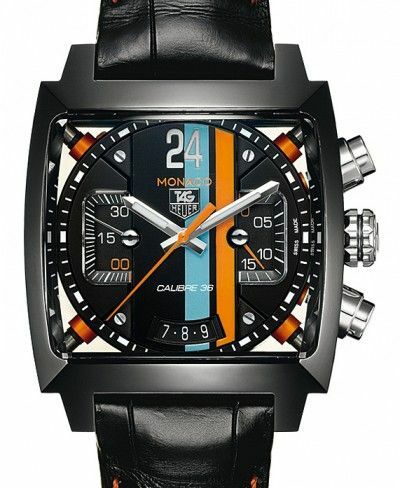 This dazzling, rectangle-shaped wristwatch is inspired by Monaco’s legendary Formula One raceway, as well as the high-tech marvels that speed down its straightaways, chicanes, and hairpin turns. Prepare yourself for some extra heartbeats when you see this historical timepiece in real life… or even better fit it to your wrist! A “little” touch of color is the reason why this timepiece is different from the rest. The watch features colorful accents that echo the design elements of the Porsche driven by rugged American actor Steve McQueen in the classic racing film, Le Mans. Masculine and bold, this signature Tag Heuer design provides the sort of superlative performance and durability that we’ve all come to expect from this respected Swiss watch making company. The Monaco Calibre 36 is quite sporty, but still very luxurious in appearance. Crafted from black titanium carbide, polished sapphire crystal, and sleek, ultra-modern stainless steel, this exclusive showpiece is not for the faint of heart. Meant to be worn with pride, this luxury watch is all about confidence, a sense of daring, and a winning, brave spirit. As an expensive wristwatch, it’s an alluring choice that is likely to become an everyday favorite. For sure, a lot of men out there would be proud to wear this design. In fact, the wristwatch entices the eyes and the hands, as looking at the watch makes you want to touch it. The watch itself has substantial weight, due to the fine quality of its materials. Good watches tend to have a little heft, and the Tag Heuer Monaco Calibre 36 is no exception. However, this watch is not too heavy on the wrist; it just has that satisfyingly solid feel that you always want from a top-notch luxury timepiece. Innovative engineering and state-of-the-art design are shown off to great advantage in every element of this stellar timepiece. Clean lines, precision mechanisms and a smooth leather strap offer the ideal blend of pleasing form and superb function. If you’re looking for classic, masculine style with a bit of an edge, (as well as a touch of vibrant color) you’ll enjoy wearing this exceptional, high-end timepiece. The Monaco Calibre 36 is eye-catching and even tough you aren’t able to take a peek on the inside the movement is another piece of art on itself. 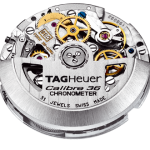 The Calibre 36 qualifies for the COSC of course (needless to mention anyway) and has a power reserve of 50 hours. This is watch that I’d choose over many others of its ilk, simply because it’s more unique and creative. I think it all comes back to the design’s colorful accents, which work with my own personal sense of style. Designed with a stainless steel case and a high-quality, black leather strap, this watch also has a fixed bezel and minute markers that border the outer edge. Equipped with an analog dial, this timepiece features luminous hands and markers that make it easy to find out what time it is, even in darker situations. The Monaco Calibre 36 is a chronograph design with a built-in date display near the bottom of the dial. The Chronograph has two sub-dials displaying 60 seconds and 30 minutes.